While sea ice melts over the summer months, the winter period is crucial to building up the sea ice cover. The cartogram distorts the Arctic Ocean by the total thickness of sea ice aggregated over the last winter. 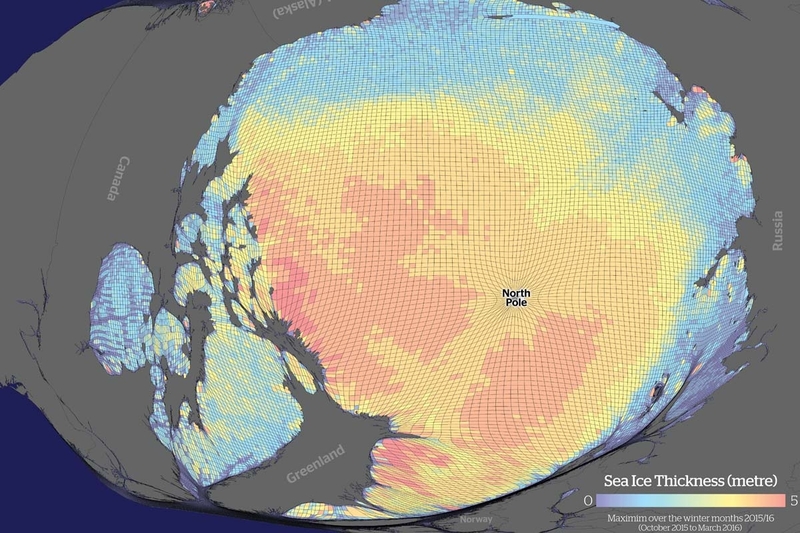 It shows the thickness of sea ice over the last northern hemisphere winter period, between the months of October 2015 and March 2016. Data used in this cartogram was measured by the CryoSat-2 satellite operated by the European Space Agency. CryoSat-2 is a sensor specialising in measuring the changes in the polar ice cover in both the Arctic and Antarctic region.